Assuming you have iCloud configured with OS X, you’ve always been able to access iCloud files from the Mac desktop by looking for a little-known directory in the user Library folder. Having access to that folder can make it behave like Dropbox, with file syncing between Macs being built right into the Finder, but the way the files are stored within that Mobile Documents directory aren’t particularly user friendly to look at since each directory is named as a lengthy GUID string. That naming convention is pretty strong evidence the directory was not meant to be accessed by average users, but that is exactly where the free Plain Cloud app comes in. These folders are all automatically synced to iCloud, which makes Plain Cloud a nice and simple file management frontend to iCloud data. 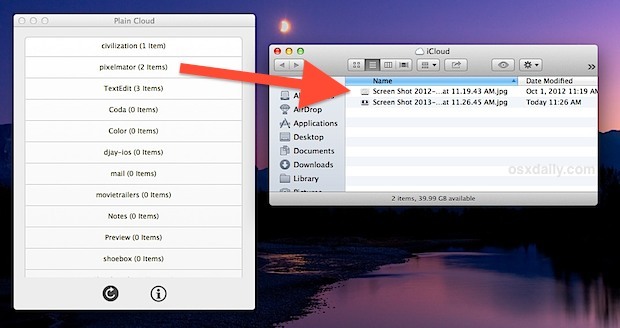 Dragging files into these Finder folders will upload them directly to iCloud which are then synced to other Macs and devices. It’s very important to point out that deleting a file from these folders is permanent and also carries over to iCloud and all other devices that use the same iCloud account. As a result, only delete something if you are absolutely certain you no longer want it anywhere, because deleting it from these folders will immediately delete it from the containing app as well, whether that’s on an iOS device or another Mac. A nice perk to having Finder iCloud access is the ability to edit documents from iCloud-equipped apps with other applications. You probably already noticed that files and settings from iOS apps are also listed and available by this app, assuming you have the same iCloud account used by both the Mac and iPhone, iPad, or iPod touch. Launch one of those folders and you can then make edits to that file in a completely different application than what it was created in. This is extraordinarily useful if you’re looking to modify a document on the Mac but don’t have the accompanying iCloud-equipped app for iOS. For a practical example that means you can do things like use MS Office on the Mac to edit a Pages document made on an iPad, then copy that saved file back to the Pages folder in iCloud, and have it be accessible on the iPad again. The more complex the formatting the more potential there is for issues with that approach, but for images and basic word documents with straight forward formatting it works trouble-free and is very useful. I got Plain Cloud yesterday and am using it a lot more than I initially thought I would. It’s so useful you’ll wonder why Apple didn’t just bundle a similar feature directly into the OS X Finder to begin with, but maybe a cloud-based file management aspect of the Finder will arrive in future versions of Mac OS X. In the meantime, take the time to set up iCloud and grab Plain Cloud, it’s a great free app that serves that purpose. You can do all of that without Plain Cloud too, though I admit such an app does make it much more user friendly. Sure, with some poking around in a User’s Library folder, you can find such files. But that requires you to sort through archaic folder names and such. This makes the process much easier. I predict that Apple will provide this level of functionality in some future OS Update. 1) Apple should have included this already. 3) When (if) Apple dose include this in the OS, they should pay the author for his idea and services. Sadly Apple keeps seeing similar good ideas that some inventive programmer creates, and then co-opts it by adding it into the OS. I kind of envision the same thing, but with a reduction of the file system. “All My Files” started this, but soon (10.9?) I bet All My Files will blend with iCloud… or maybe iCloud will become just a layer over the existing Pictures, Documents, Movies folders? All likely, in my view. Unfortunately it’s fairly useless. I understand the limitations that maybe imposed on the dev here, but if you really want to make a match with the likes of Dropbox, then the app needs the ability to create folders within iCloud. For example, I _have_ to use MS Word for Mac at work, as it’s not an iCloud aware app, there’s no way to save files to those folders in iCloud, unless that is, you save it in a folder intended for another iCloud aware app, obviously firstly saving it to your local hard drive then manually moving it into iCloud. Apple intentionally dumbed down iCloud so that you couldn’t put your own files in there which is a rotten idea. They could have at least put in their ‘generic’ folders such as ‘Documents’, ‘Pictures’ and ‘Music’ for example and integrated it right into the Finder, like iDisk did before it, but it’s not to be. Apple need to up their game here. Cloud Mate from RED When Excited http://www.rwe-uk.com/app/cloud-mate does exactly the same thing. Also, I’m sure Apple are working on making iCloud functionality like this – it’s just not ready for prime time yet. Burned by .Mac and MobileMe they don’t want a third time failure. When they’re ready, they’ll just turn it on.